Otto Lang immediately replaced Friedl and was given the position of executive ski school director. With Pfeifer's vigor channeled on Aspen's development solely, it was up to Lang to thwart France's sometimes-ugly attacks on Hannes Schneider and the Arlberg technique. Lang, who would spend the majority of the 1947-48 ski season producing a movie for Hollywood guru Darryl Zanuck and representing Sun Valley at the 1948 Olympics in St. Moritz as the resort's goodwill ambassador, had the formidable duty of replacing Friedl Pfeifer with someone of equal stature. For such a daunting task, Lang turned to his mentor Hannes Schneider in North Conway. Schneider, who always encouraged his best instructor's to advance themselves, suggested Toni Matt. Toni Matt had been trained from youth by Schneider to be an instructor in St. Anton and fled to the United States in 1938 where he quickly became one of the leading U.S. ski racers. Twice national downhill champion and combined U.S. champion in 1941, Matt is best known for his suicidal schuss of the 4,300 vertical Head-wall slopes of Tuckerman's Ravine, on New Hampshire's Mount Washington. Matt was also a member of the U.S. 10th Mountain Division where he served with several of Sun Valley's best-known instructors. Accepting the position of ski school director, Matt ran the school in typical Hannes Schneider fashion-allowing Lang to concentrate his energies on representing Sun Valley at the first Winter Olympics held since 1936. Sun Valley 1948 Ski School and their Autographs / Lang and Allais Pictured Center Front. The 1948 Winter Olympic Games held in St Moritz, Switzerland were the first held since 1936. As France's racers, using Emile Allais' new ski techniques, controlled the Men's events, winning three out of the six alpine medals with their star Henri Oreiller (Who won two gold and one bronze), French skiers soon caught the eyes of a world who rapidly acquiring an addiction to alpine skiing. Not to be out-done, Sun Valley's Arlberg presence would also be felt in St. Moritz as its own Gretchen Fresher - who during the course of her career was coached by Sun Valley Instructor's: Sigi Engle, Otto Lang, and Friedl Pfeifer - took home America's first alpine medals in both the slalom and combined events. Sun Valley and the United States also accomplish a respectable performance in the racing skills of 15-year-old Andrea Mead. While in St. Moritz, Lang had the opportunity to meet the skilled Allais briefly where he gained an almost immediate liking to the Frenchman's quite charismatic qualities. Lang, as well as Schneider, respected Allais' "gentleman qualities" but saw in the "French Technique" a lacking of the fundamental foundations required to learn. As the world press began billing this confrontation as skiing's first great schism, Lang returned to Sun Valley to find all was not well. While the ski school under Toni Matt functioned well, Matt's chances of returning for a second season became unlikely due to his involvement in an adulterous love affair that became public. Faced with the daunting tasks of again replacing Friedl Pfeifer with someone of equal caliber and thwarting the ever-encroaching presence of the "French Technique" on American ski resorts, Lang came up with a controversial solution, which, to him, solved both problems. Hire Emile Allais and turn the eyes of the skiing world once again to Sun Valley. With Allais teaching in Sun Valley for the 1948-49 ski seasons, the long awaited confrontation between the two contrasting turn styles would, after 13 years of lingering, at last have its day in court. Said Allais of his emerging "French Technique," "my method is just right for this country, it is Loose and free, just like the spirit of you Americans." Allais' anticipated stateside unveiling garnered such immense publicity that his picture appeared on the front covers of both "Ski" and "Life" Magazines' winter issues. Through Friedl Pfeifer's and Otto Lang's streamlining of Hannes Schneider's "Arlberg Technique," far less emphasis was being placed on the stemming of the skies. Such streamlining secured a more parallel demeanor for the "Arlberg" resulting in less dissimilarity between it, and the "French Technique." Where the teaching styles differed, the "Arlberg" clearly proved superior. From the beginner, the "French Technique" was a disaster. By discarding the stemming of the skies as the basis of learning and eliminating the snowplow, Allais gave the novice skier little in which to acquire a strong foundation of balance. For the advanced skier, Allies' "Ruade" (lifting the tails of both parallel skies off the snow, which initiated the turn in midair, to head the skies in the opposite direction) lacked the flowing and less taxing coherence of the Arlberg. Said Otto Lang of his instructors as he watched them practice the Ruade, "They reminded me of a flock of bunny rabbits hopping around and frolicking in the snow." I interviewed Otto Lang in the early 90s on one of his visits to Sun Valley. His attention to details was astonishing. His pivotal role in the history of Alpine Skiing nearly equals that of his mentor, Hannes Schneider. In his later years, Allies would eventually acknowledge the frailties of his "French Technique" as he and Lang skied together near Flaine, France. Following Allies' tracks down a ski run, Lang shouted "Hey, Emile, what about the Ruade?" Allais replied, "Extent as the dodo bird. The close of the 1948-49 ski seasons would see the departure of Allies from Sun Valley to head the ski school of Alex Cushing's newly developed Squaw Valley in California. Although the "Ruade" never lived up to its expectations of replacing the Arlberg, Allies,- like Hannes Schneider, Averil Harriman, Friedl Pfeifer and Otto Lang, - became a true renaissance man of skiing also. Allais would train and coach the American men's 1952 Olympic team taking it from the bottom ranks of international racing to produce a fifth place in the downhill and sixth in giant slalom. He also trained dozens of the world's top racers as well as inventing the first non-wood ski used in international racing. Settling back in Europe following his American assail, Allais eventually became France's technical director for the development of ski resorts. Allais died in October 2012 at the age of 100 and he along with Jean-Claude Killy are considered France’s greatest alpine skiers. 1949 would also mark the addition to the Ski School of Leif Odmark from Sweden who was hired by Otto Land and Sep Froelich. 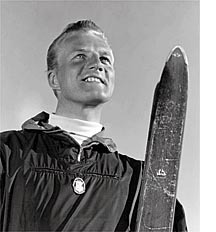 While Odmark’s initial training involved solely the Nordic disciplines, he learned the Alpine aspects of the sport quickly and instructed both Alpine and Nordic (Telemark Downhill) for 22 years. In 1951, Odmark was selected to coach the 1952 American Nordic Olympic Team in Oslo, Norway and in 1970, opened Sun Valley’s Nordic Center where both Cross Country and Telemark aspects of the sport were taught. Odmark also acquired the guide’s license for the Pioneer Mountains where occasionally directed tours to Pioneer Cabin took place from the late 70s to early 80s. I interviewed Leif in 1999. 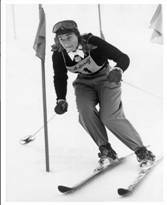 In addition to Odmark, American Ski Instructor Bill Butterfield was also added to the Alpine crew. Butterfield grew up skiing in Big Bromley, Vermont where he quickly learned the essentials of the sport from his mentor, Fred Iselin. Certified as an instructor at the age of 16, Butterfield held the distinction of being the youngest licensed ski teacher in the East. 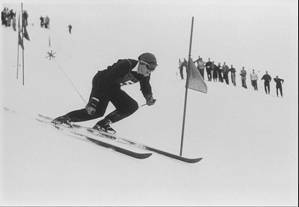 After a short stint in the Navy, Butterfield traveled to Sun Valley in 1948 where he soon acquired a position on the Otto Lang – Emile Allais Ski School. He would add to his skiing responsibilities in the summer months as well by directing the ski school of New Zealand’s Coronet Peak in the early 1950s. Butterfield’s talents as an organizer and a leader made him the perfect choice for assistant director during the Sigi Engl era, as he assumed the subordinate role of the man behind the scenes. The alpine touring (ski mountaineering) school began is rapid decline in the late 1940s as lifts and the rapid development of ski resorts in the United States, Canada, Europe, South America, Australia and New Zeeland change the character of the sport. Why climb a mountain when you can ride up it? The winter of 1948-49 would also see the destruction of the Owl Creek Cabin as that year’s heavy snows released devastating avalanches. While the Owl Creek Cabin would rebuild that summer, its new prescience did little to rejuvenate interest in this rapidly declining pastime. After the war, Hennig and Gottschalk continued to guide guests through the vast lift-less Sun Valley surroundings, however the insurgence of immensely improved transportation up the slopes of Bald mountain as well as tremendous improvements in “alpine” skiing techniques marked the beginning of the end for the “alpine touring” school. Only one minor resurgence of Sun Valley’s short-lived “alpine touring” past occurred in the summers of 1947 and 1948 as Harriman and Hennig teamed up to breathe new life into this rapidly fading sport. In the summer of 1947, after touring the beautifully striking snow-filled bowls of Boulder Basin, (one of Hennig’s many “alpine touring” sights) Harriman directed Pat Rogers (Sun Valley’s general manager at the time) to promote spring and summer skiing in Sun Valley. As a result of this request, one week later, two jeeps were available to transport skiers up to Boulder Basin and for a few weeks, summer “alpine touring” was popular again. Slalom races were even held on the 4th of July 1948 which was covered by Seattle movie tone news. To encourage this reincarnation even more, Hennig, also at the request of Harriman, began work on Sun Valley’s first, and to date, most comprehensive “alpine touring” guide book. Published in 1948, “Sun Valley Ski Guide,” authored by Andy Hennig, detailed extensively Sun Valley’s many regions in which to both “alpine” ski and “alpine tour.” Publications such as this were very popular as well as common in the Alps, and Harriman hoped that such a manual might rejuvenate interest in Sun Valley “alpine touring” again; however, this would never come to pass. The winter of 1952 marked the unofficial end to Sun Valley’s “alpine touring” school as avalanches down Baldy’s Lookout Bowl, claiming the life of Victor Gottschalk, and Bromaghin Peak, destroying the Owl Creek cabin, eulogized a dire end to a historic institution. While Haemmerle, with his “old gentleman’s club” and Hennig, with his “seasoned ambitious clients,” occasionally “alpine toured” after 1952, this was done without the blessing of Sun Valley company. Hennig never gave up his dreams of developing Sun Valley’s vast mountainous surroundings into an alpine touring center equaling those in Europe as he and Sun Valley 10th Mountain Veteran Willy Helming with an occasional appearance from Leif Odmark, made numerous skiing descents in the Pioneer, Lost River, Lemhi, Boulder, Smokey, White Cloud and Sawtooth Ranges from the late 40s thru the early 70s. While Sun Valley’s limelight in the history books may have occurred as circumstances of an era, as some might argue, exposed within the soles of its pioneering founders, an everlasting mountain endeared resourcefulness ensued which transcended these historic times in a uniqueness and expertise found only in Sun Valley.